We are all fair-weather gentlemen (and ladies) when things are going good. It is easier to adhere to gracious dignity when you are fed well and your life is not in jeopardy. Even more important is the well-being of those around you. You do not take advantage of people when you are not in a position to take advantage of them, or rather they are not in a position to allow you to take advantage of them. That is what defines morality. When we are kind to people who we cannot afford to be unkind to that is nothing but animal self-protection. It is when we are kind to people with whom we have no reason to be kind, people who cannot hit us back; that is divine decency. Among the dead are roaming the religious people of various hues moving around not to protect and serve them, but to convert their faith. They know out of their homes, having lost their loved ones, these children of broken Earth are at the edge of their fractured belief. How can one continue to believe in a God which sits there on a judgment chair, presiding over the deaths of children, so young that they aren’t yet corrupted by life? How can someone explain to a believer that the tectonics plates shifted without the mother earth pausing to hear the cries of despair of her own children? Although, thanks to the atheist communist philosophy, Nepal is not a Hindu nation anymore. The last bastion of arguably the third largest religion in world is no longer that constitutionally. Beguiled by the developed nations, where heads of state still swear oath to the God and Holy Spirits, Nepal had embraced secularism, but the ethos and the faith of its people is still is Hindu. This tragedy saw people in droves coming in telling them not to restore the citadels of what they call ‘pagan’ belief, the temples and all and rather come to the only savior, the Jesus Christ or to the Religion of Peace which is currently causing big trouble to world peace on account of fanatic believers. They propose to serve the troubled with shamelessly undisguised appeal to join their religion in return to earn their right to their service. I wonder whatever happened to the sense of humanity. Why this quid pro quo? Why can they not stick to their already shaken belief and still be served? When days are bleak and everything that you know as way of life is lost by the enormity of nature in face of which humanity is next to nothing, it is faith, however fractured, kinship with fellow human beings, however distant and hope in future, however disfigured which keeps life going. It is our capacity to keep on hoping which separates us from other life forms, and elevates us. On the same count, it is our ability to spiral into the deep, dark abyss of hopelessness which again separates us from any other human being. A time of disaster is the time to help our brethren to hold on to that holy hope. The roads are dust filled, debris of a devious, devastating nature is spread around, but life holds hope. The Dharahara Tower came down in 1834, and came up, it went down again in 1934 and again came up. It is the proud head of unbeatable human spirit. Let us fill those audacious wings, through broken and tired at the moment, with our prayers, whichever God we may pray to and see them soar high towards the Sun. We are all one in tragedy. The hope will rise from those broken crevices of the earth on the street of Nepal and make a new nation, of people defiant of the cruelty of nature. All they need is little time and faith, for their faith to heal up. They do not need a new faith. They need to know that we, who haven’t seen them, breathe for them and pray for them to our Gods which might be different for theirs. It is just a coincidence, a stroke of luck that we are not in the news that we watch and luck, as we know is pretty capricious. Let them be with their faith and be loved as human souls. Let us not deprive them of whatever of faith is left with them, ashen, dust-filled it may be, it is theirs. Let us not hit the people when they are down. No religion can keep those tectonic plates from moving, or the volcano from erupting in Christian Europe or Tsunami from hitting Indonesia. Religion can help survive these disasters and help us keep the hope alive. I am not a religious person and I do not know if God exists. As Jules Renards once famously quipped, “I do not know if God exists, but it would be better for His reputation if He didn’t”, my sad despair shakes head in agreement in the face of such large-scale, heart-wrenching disaster, but then I also agree with Voltaire in the interest of my best reasons, which I would call hope, that “If God did not exist, it would be necessary to invent him”. It would be necessary to restore faith, not to exchange it with a new one as those people that Internet defines as soul vultures, who would scout troubled grounds for religious conversion. I have spent years and years in sales. I still remember when I had been to Nepal for a sales meeting with a prospective customer. The morning when I landed, I got a call from the customer asking if I have reached safely and to further surprise me, asking if he needed to send a car to pick me for the meeting. When was the last time it happened to me that a customer proposed to send conveyance for me for a meeting- Never. Not in India, only Nepal could do that, pamper you as a guest and disarms you as a friend with complete trust. A nation like that needs to be preserved with its faith and philosophy. It would do well for the rest of humanity to preserve such a nation without attempting to scavenge over its dead, to make such a sweet soul subservient. 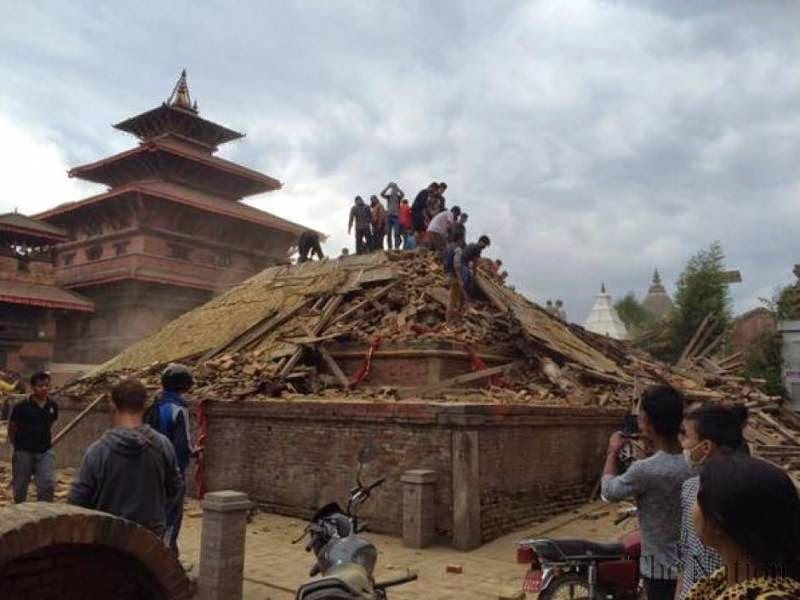 Let us stand by Nepal and preserve the old in the new we build. When the Tectonics moved centuries back, a glorious mountain came into being. A glorious nation will emerge this time as well, glorious, defiant and brave.